Salon des Amateurs is a small club located in the Kunsthalle Düsseldorf. 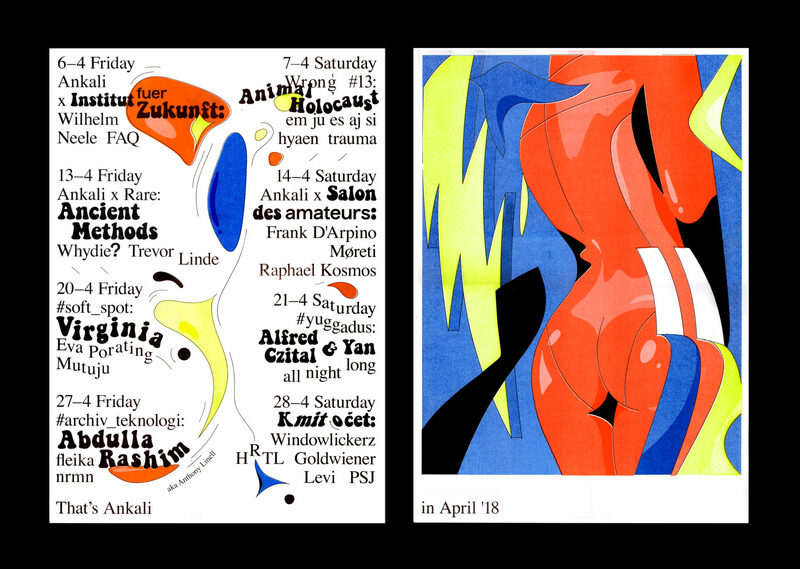 A few years ago the word started to spread about their impeccable bookings and resident djs spinning obscure outernational trax all night, such as Vladimir Ivkovic, Lena Willikens and Tolouse Low Trax. Nowadays the world is discovering a new wave of Salon affiliates, and one of them – Frank D’Arpino is coming to Ankali. Under his hands krautrock shares frequencies with ultra-slo-mo disco and persian echoes of schengen dance trax – essentially it’s finest djing provided by a wide musical mind with no preoccupations. Joining him will be two local kosmische experts each in his own way. Møreti is a resident at Ankali who tends towards slower dance oddities while Raphael Kosmos of Endless Illusion is known for his deep knowledge of electro-infused dance sounds.